Home » Blog » Posts » Words from our leader. This post is by Annette Baldwin, Project Leader, Tonga. Well the time has certainly been flying fast and today is the last day of surgery. The visit to Tonga has certainly been memorable with many “firsts” for an Open Heart International team in this country. The team has been absolutely fabulous – one of the phenomena of a team to be so cohesive when they have never all worked together before let alone even met before they arrived here in Tonga. We have been the recipients of much hospitality from the Tongan people – I am glad that only our bags will be weighted in at the airport as the team has been incredibly well fed over the past two weeks! The Tongan’s love a feast – and this is the way they show their appreciation. So this week is a week of hospitality with various organisations taking turns to host an appreciation dinner for the team. On the work front, I have to congratulate each and every person of the team that have worked tirelessly over the past two weeks, and also to Dr Toa and Dr Sione and their team’s of local staff who have been a wonderful support to the team and patients also. As a combined force, we have all played a part to give 28 Tongans a second chance of life. Thank you also to everyone who have financially supported this trip. I’d also like to acknowledge the well wishes and supporters back in Australia and all the team’s friends, families and colleagues. Your support for the team is well and truly appreciated. I hope you are enjoying reading along each day with our adventures. P.S. 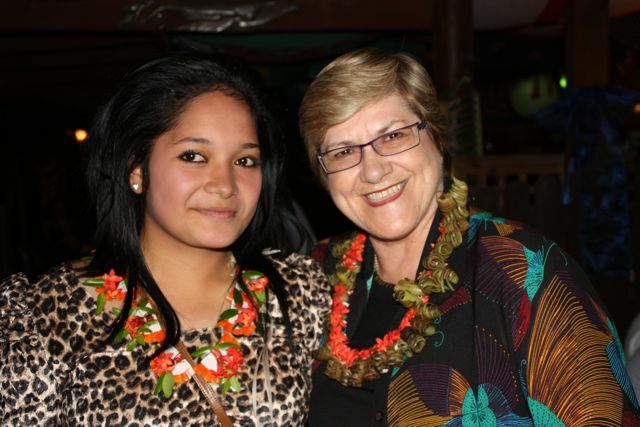 The picture below is with Ana* at one of our functions last week. If you haven’t read her wonderful story, click here.